1. Sauté onion in butter by placing both ingredients in a glass measuring cup covered with a paper towel and microwaving for 1-2 minutes, until onions are translucent. 2. Using a mixer on low, blend biscuit mix, buttermilk, ham, cheese, cajun season, onions and butter together until a thick dough forms. 3. Using an cookie scoop, fill non-stick or greased muffin tins with batter and then bake at 425˚ for 12-15 minutes or until a fork poked through the middle comes out clean. 4. 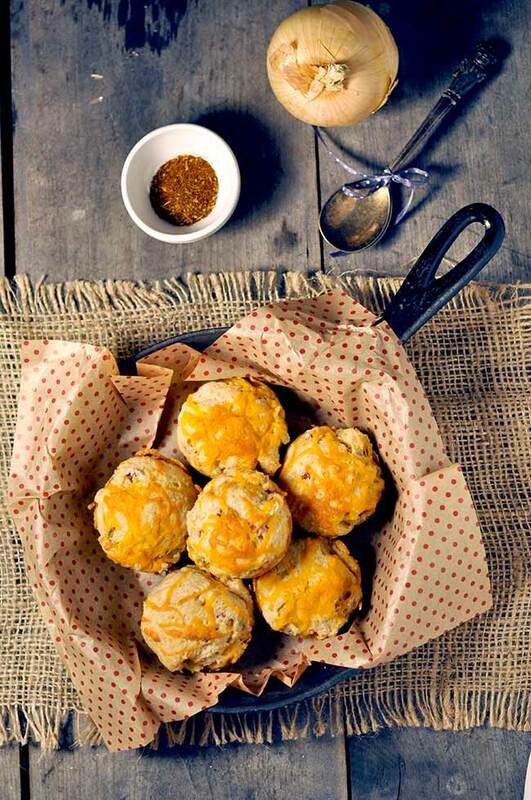 While biscuits are still warm, combine garlic powder with melted butter and brush onto the tops of the biscuits. Need a quick but yummy and filling breakfast or snack? 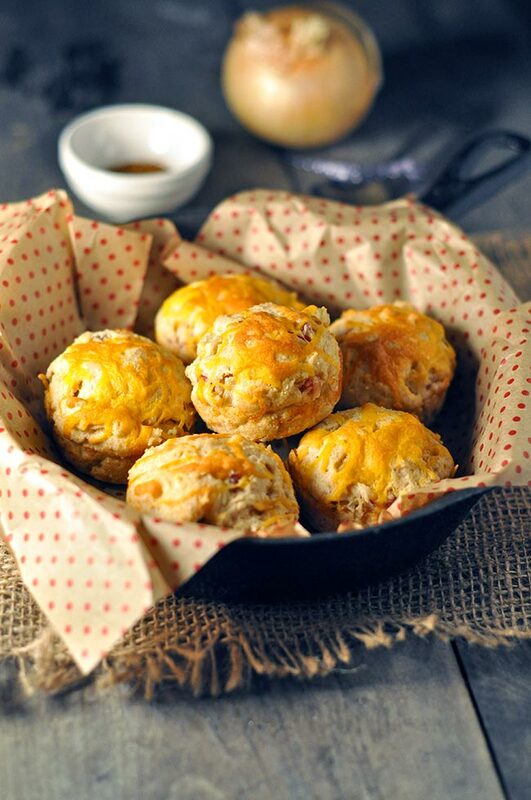 These ham and cheese biscuits are just the thing! They’re super easy to whip up and enjoy fresh or you can make them ahead and reheat them for a quick breakfast on the go. There’s nothing quite like fresh from the oven biscuits but in our house, we don’t have a lot of time to fuss with food that involves a lot of prep. We typically have Bisquick on hand to save on time. However, if you don’t have any on hand or would prefer to make your own biscuit mix, check out this recipe for homemade biscuit mix. Not a fan of Cajun seasoning? That’s okay, I forgive you. 😉 If you prefer a simpler flavor, you can leave out the seasoning all together. Or if you’re just looking for a different flavor, more similar to the famous Red Lobster cheddar bay biscuits, you can replace the cajun seasoning (just use half the amount) of Old Bay. You can make these muffin shaped or bake them on a flat, lined baking sheet. They can get a little crumbly, so I like using a muffin tin and if I have some, I’ll use liners. I mean… I did eat them for dinner with a side salad. It felt balanced. 🙂 These really work well for literally any meal. I’ve made them for breakfast, brunch, lunch and dinner. And also snacked on them. So, enjoy them however you want! 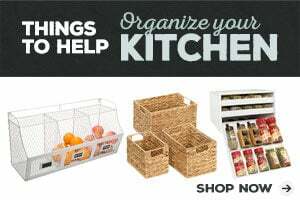 Want more yummy recipes ideas? 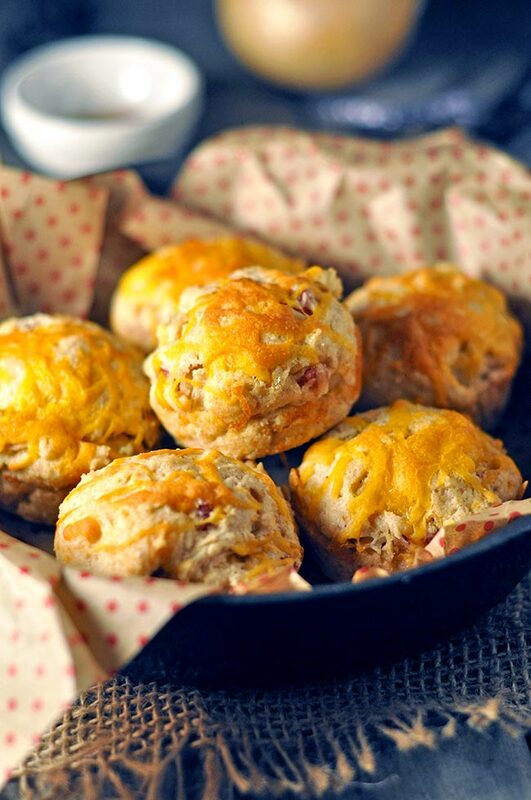 These easy Cajun ham and cheese biscuits were featured on Sew It Craft It Cook It and Menu Plan Monday!